This month marks the 200th anniversary of Jane Austen’s death. With that in mind, I thought I’d tell you a bit about mourning customs of that time, specifically in terms of fashion. The prints shown are from my own collection. In the 18th and 19th centuries, when a family member died, it was important to honor that person with a public display of mourning. Black clothing was a public show of respect. We do that today by wearing black or dark clothing to funerals, though even that is no longer considered important. 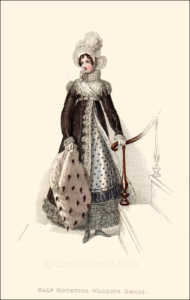 But the Georgians, and especially the Victorians, wore mourning clothes for much longer than one day. 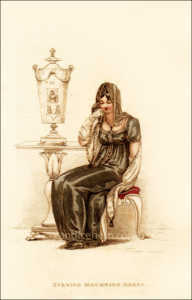 Sometimes, for widows in particular, mourning clothes may have been worn for a year or more. Queen Victoria wore black mourning dresses for 40 years after the death of her husband, Prince Albert. Note that “undress” refers to informal wear. “Weepers” refers to cuffs on the sleeves, usually made of white muslin, and were so called because one could use them to wipe one’s eyes and nose when weeping. These were worn by both men and women. Figure 4: Ackermann’s Repository of Arts, January 1819. Half Mourning Walking Dress in honor of Queen Charlotte’s death. Though the type of clothing is strictly prescribed, in terms of color and fabric, social activities were not much curtailed, even during deep mourning, as you can see with the prints showing evening dresses in full mourning. It appears to have been sufficient to wear clothing that honored the deceased person, without the need to restrict social activities. In certain cases, the king requested that public theaters remain closed for a short period of time, as he did with the death of his brother, the Duke of Gloucester, in 1805, and the death of his beloved daughter Princess Amelia in 1810. In both cases he requested that theaters remain closed until after the funeral. Personal mourning, ie for the death of a loved one, did have expectations of curtailed social activity, especially for women. Widows typically wore deep mourning for a year, and half-mourning for another 6 months or so, and were more or less confined to home during that first year, or least for the first 6 months, only going out to attend church services. They could receive visitors, but did not return those visits. Daughters who’d lost a parent were similarly confined to home, but not for as long as for widows. Many young women had to forego a London season if they were in mourning for a parent. Widowers and sons were not apparently held to the same restrictions. Figure 5: Ackermann’s Repository of Arts, December 1818. 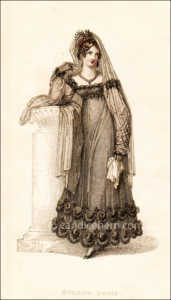 Evening Dress representing full mourning for the death of Queen Charlotte. 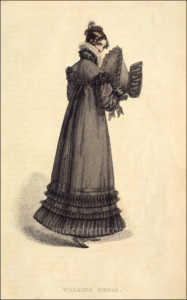 Though the majority of fashion prints showing mourning dress were published at the time of a public court mourning (with the exception of Figure 3, a rare example of personal mourning), readers likely used these magazine prints to determine styles and modes for personal mourning. As the country was at war with France, and battlefield casualties were sometimes high, there would have been many occasions for ladies to don mourning clothes. 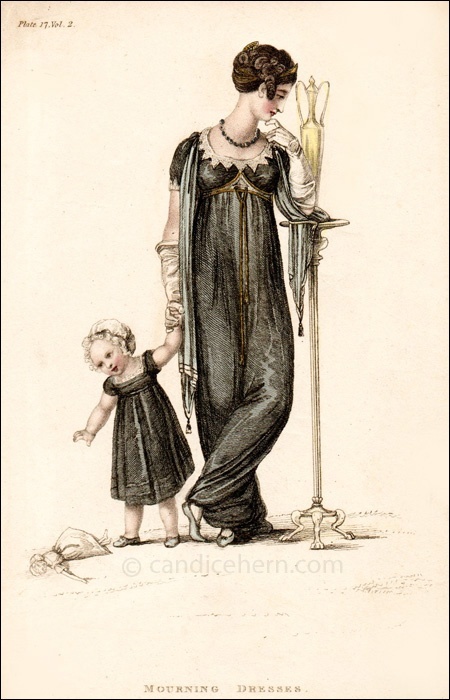 When Jane Austen died on July 18, 1817, her mother and her beloved sister Cassandra would have worn deep mourning – perhaps not as high fashion as the designs in these prints, but unrelieved black with no shine. Candice Hern is the award-winning, bestselling author of historical romance novels set during the English Regency, a period she knows well through years of collecting antiques and fashion prints of the period. She travels to England regularly, always in search of more historical and local color to bring her stories and characters to life. 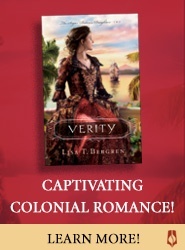 Her books have won praise for the “intelligence and elegant romantic sensibility” (Romantic Times) as well as “delicious wit and luscious sensuality (Booklist). 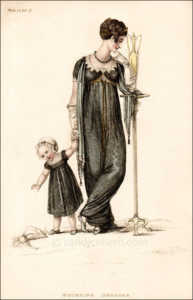 Candice’s award-winning website (www.candicehern.com) is often cited for its Regency World pages, where readers interested in the era will find an illustrated glossary, a detailed timeline, illustrated digests of Regency people and places, articles on Regency fashion, research links, and much more. It is the only author website listed among the online resources for the Jane Austen Centre in England. Visit www.candicehern.com for more information on all Candice’s books, including excerpts and a look “behind the scenes” of each novel. I love this piece. And the plates are perfect! We always see fashion prints about ball gowns and morning gowns, but mourning pieces are hard to find, so it’s great to see what they looked like. Also good to know when it’s appropriate to wear what depending on your relationship with those departed. So interesting! Thanks for sharing all this info. I feel sorry for the wives who had to mourn for such a long time and couldn’t go out and do stuff. What was the point of that? It was all about showing respect. But it’s typical, isn’t it, that a woman’s show of respect was a lot longer and more restricted than a man’s. Terrific post! Thank you for sharing. Very interesting. I keep seeing Scarlett O’Hara dancing a reel with Rhett Butler while wearing her mourning dress! Ha–I love the story of how that scene was filmed. So classic.